You may remember Danielle and Jeff from their "How He Asked" feature, published in June. Today, we're excited to share with you their betrothal ceremony, a traditional Catholic rite of blessing for engaged couples. If you're not familiar with the Rite of Betrothal, read on to find out what it is, how it's done, and why they are increasingly popular amongst young Catholics. In Danielle's words: On Sunday, March 12, 2017, Jeff and I arranged for the priest at St. Joseph Catholic Church in Miesville, MN, to celebrate the Solemn Rite of Betrothal for us after Mass in the Extraordinary Form. It only lasted about 15 minutes, but it was a beautiful little ceremony for blessing our engagement. 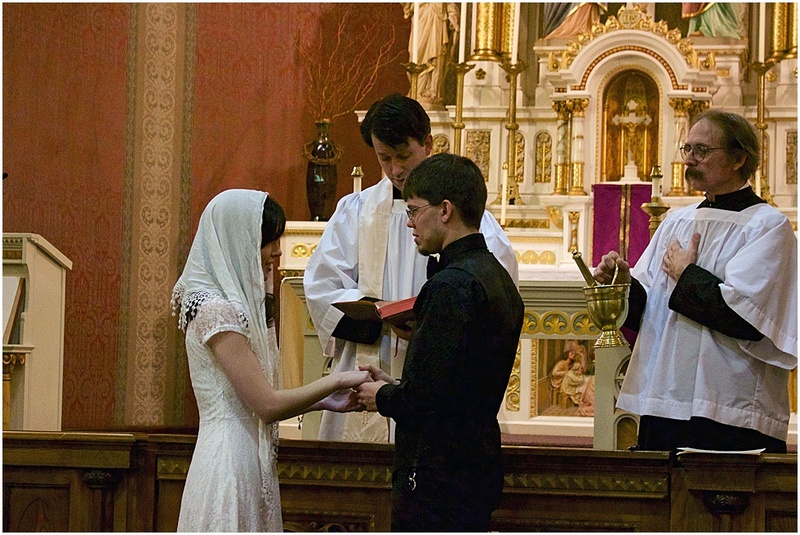 For those who are not familiar, the Rite of Betrothal, in the Catholic Church, is a free, mutual, true promise, vocally expressed between a man and woman who pledge themselves for future marriage to one another. It is a praiseworthy tradition to have a Catholic couple’s engagement solemnized and blessed by the Church. Although it is not a sacrament, it is a sacramental and a canonically binding agreement between both parties. Beloved of Christ: It is the dispensation of Divine Providence that you are called to the holy vocation of marriage. For this reason you present yourselves today before Christ and His Church, before His sacred minister and the devout people of God, to ratify in solemn manner the engagement bespoken between you. The priest continued with his allocution and then asked us to join our right hands together. The priest asked for us to repeat after him, starting with Jeff. In the name of our Lord, I, Jeff Rother, promise that I will one day take thee, Danielle Duet, as my wife, according to the ordinances of God and holy Church. I will love thee even as myself. I will keep faith and loyalty to thee, and so in thy necessities aid and comfort thee; which things and all that man ought to do unto his espoused I promise to do unto thee and to keep by the faith that is in me. In the name of our Lord, I, Danielle Duet, in the form and manner wherein thou hast promised thyself unto me, do declare and affirm that I will one day bind and oblige myself unto thee, and will take thee, Jeffrey Rother, as my husband. And all that thou hast pledged unto me I promise to do and keep unto thee, by the faith that is in me. After, the priest took the two ends of his stole and in the form of a cross placed them over our clasped hands. Then he declared us betrothed and sprinkled holy water over us in the form of a cross. Afterward, he blessed my engagement ring. Jeff took the ring and placed it on my index finger saying, "In the name of the Father," then on my middle finger, "and of the Son," and finally placing it on my ring finger, "and of the Holy Spirit. Amen." The priest finished the readings for the Rite of Betrothal and two witnesses came up to sign the document, along with our signatures and that of the priest. It was a beautiful moment for us and I am very happy we chose to participate in this holy tradition of the Church. I believe it has added abundant blessings and graces to our engagement, which I firmly believe will continue manifest even more fully once we enter into the Sacrament of Holy Matrimony.